The purpose of the Southern Cassowary’s distinctive casque (helmet), which is unique to every individual, is unknown, but recent research suggests that it may help cassowaries to feel the low vibrating sound made by other cassowaries over long distances. This unusual sense, called infrasound, was used by some dinosaurs, and is also shared by a few modern animals, including cassowaries and elephants. As you may have noticed from the footage, these photos were taken from a relatively close distance which wasn’t planned and should be avoided during Wild Cassowary Interactions. The Southern Cassowary is a predatory animal and should be respected as such. In this scenario I was fortunate the male Cassowary paid absolutely no attention to me and wasn’t threatened by my presence. In the Etty Bay region, it is quite common for people to be approached by these beautiful birds, always remember not to feed them or get too close! 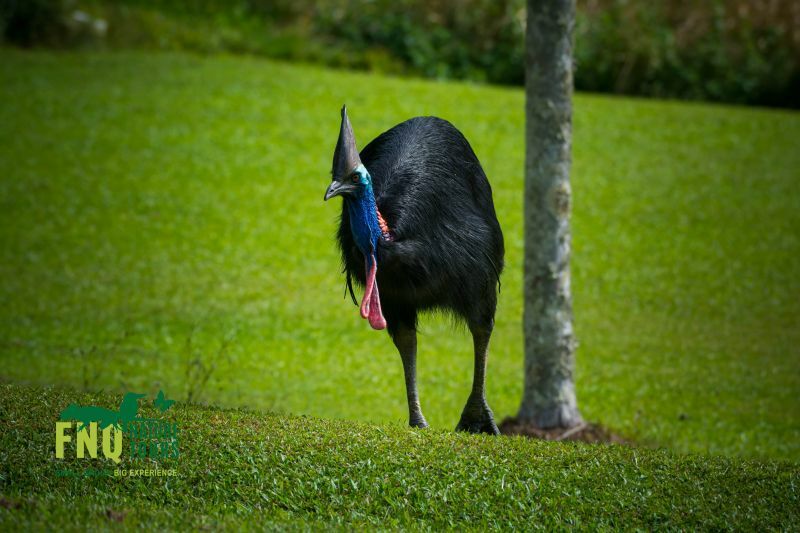 The colorful cassowary is one of the most recognizable icons of the Wet Tropics. This striking bird with its brilliant blue and purple head and neck, red wattles, and amber eyes, appears extensively on promotional brochures and souvenirs throughout the region. However, it is an endangered species and its future is uncertain. In evolutionary terms, the flightless birds (or ratites) were some of the earliest types of birds to develop. The Southern Cassowary, Emu, Rhea, Kiwi and strich are still around today, but others, like the moas of New Zealand and the elephant bird of Madagascar are now extinct. Cassowaries evolved in a region of the supercontinent, Gondwana, that later broke apart and became Northern Australia, Papua New Guinea and some of the eastern island groups of Indonesia. Three species of cassowaries are found in Papua New Guinea but only the southern cassowary (also known as the double-wattled cassowary) lives in Australia. Two separate populations of cassowary are found here – one in the Wet Tropics between Mt Halifax/Paluma and Cooktown, and the other in the Shelburne Bay area and eastern Cape York Peninsula (McIlwraith and Iron Ranges from Temple Bay to Massey River, and possibly into Princess Charlotte Bay). 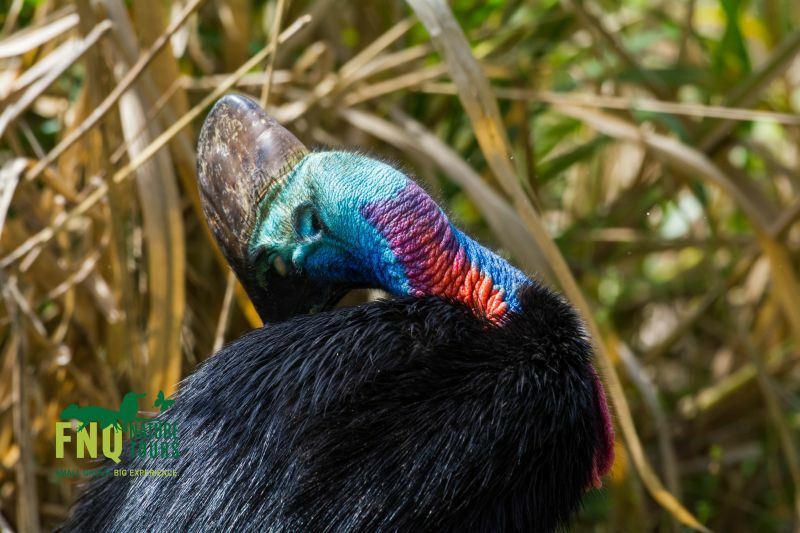 Cassowaries are most often found in rainforest, but also use woodlands, melaleuca swamps, mangroves and even beaches, both as food sources and as connecting habitat. Cassowaries in coastal areas, such as around Mission Beach, seem to prefer a mix of these environments. Cassowaries have turned the tables on what is mostly a maternal social structure in the animal world! After mating, females will lay a clutch of eggs, and then seek other males with which to mate. For each male that she finds, she will provide a clutch of eggs (usually 3 to 5) for him to nurture. The males incubate the eggs, and raise the chicks, caring for them until they are able to look after themselves. Somewhere between 8-18 months of age, fathers will banish the sub-adults from their home range. The young birds wander off to find their own patch of habitat, and start learning their way around. This is a vulnerable time for young cassowaries. Dogs can easily chase them and kill them, they are more likely to wander onto roads and get hit by vehicles, an adult cassowary already resident in an area might attack them, and they may not be able to find sufficient food in a new and unfamiliar area. Cassowaries are one of only a few species that can disperse large rainforest fruits and are the only long distance dispersal agent for large seeded fruits. These huge birds are the only animals capable of distributing the seeds of more than 70 species of trees whose fruit is too large for any other forest dwelling animal to eat and relocate. 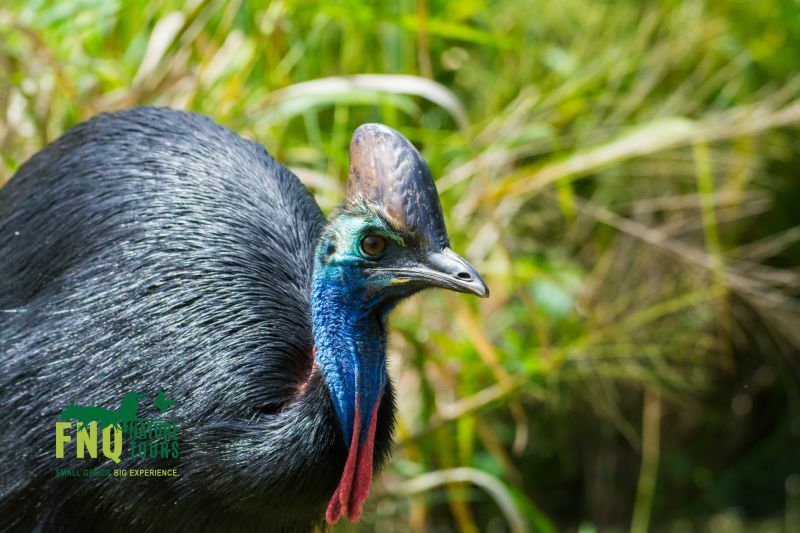 In other tropical forests around the world, there are a wide range of animals which fulfill this role, but without cassowaries, rainforest in the Wet Tropics would gradually change and become less diverse. the Mission Beach area which has suffered extensive habitat loss to the degree that the birds have been squeezed into unnaturally small home ranges. They are forced to seek food from plantation sources and this closeness to human settlements brings them into more frequent contact with dogs. As they try to move around the remaining patches of habitat between the beach and the sloping hinterland behind it, they are commonly run over by cars. 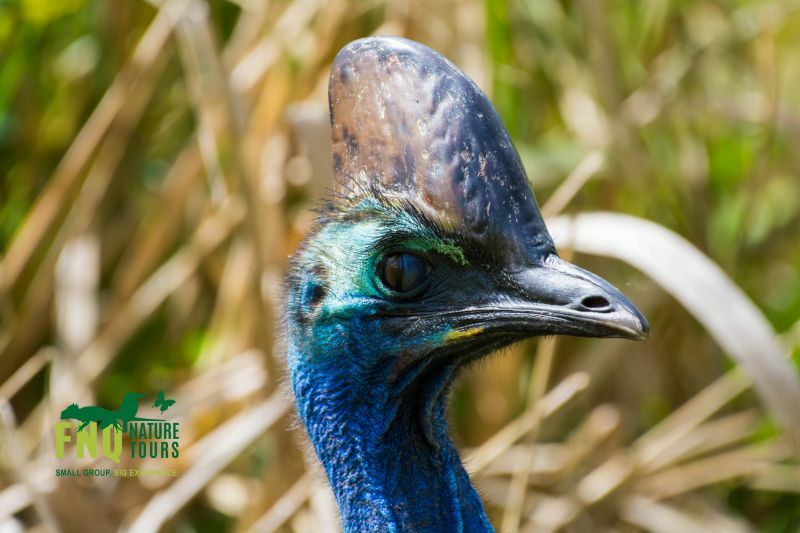 For more information on how you can spot Southern Cassowaries on tour with FNQ Nature Tours, please click here.